The ribbon cutting ceremony was lovely, thanks to all of Faith Olen’s hard work. 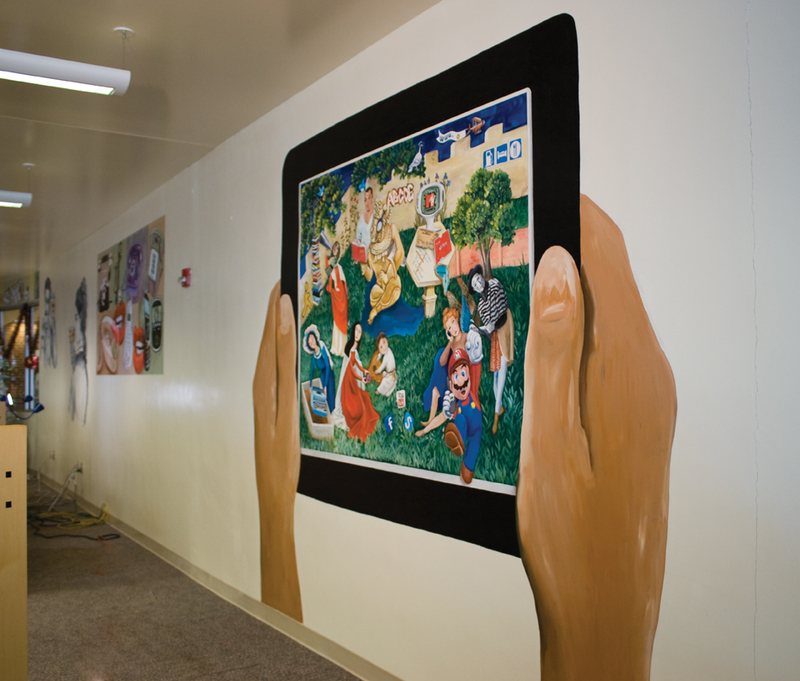 I thought I would finish my Orange Mural blogging with one final tour and explanation. (Maybe I’ll see you at the Meet and Greet in a couple of hours at the Artists Gallery in Virginia Beach.) If this is too lengthy to read, cruise through the pics and visit me soon for an update of what’s next. Communication is an enormous and fascinating topic. The only way to make it even more intriguing is to exemplify its many mutations using artistic expression. I know what you’re thinking. Yes, art is an aspect of communication! How perfect. The earliest cave paintings pre-date the first written words by about 27,000 years. Every culture and society has contributed innovative methods to communicate to one another, to leave their mark socially and to advance civilization globally. 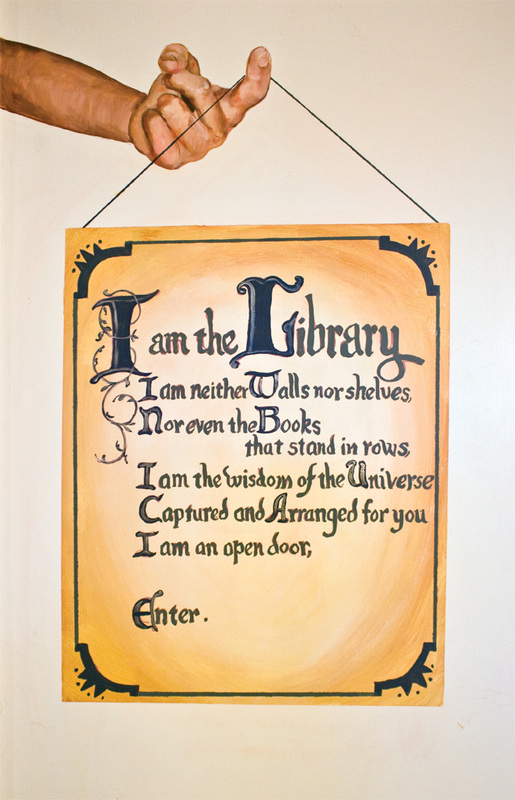 The traditional library, filled with books, is quickly becoming the “multi-media center” offering many tools for the seekers of knowledge. 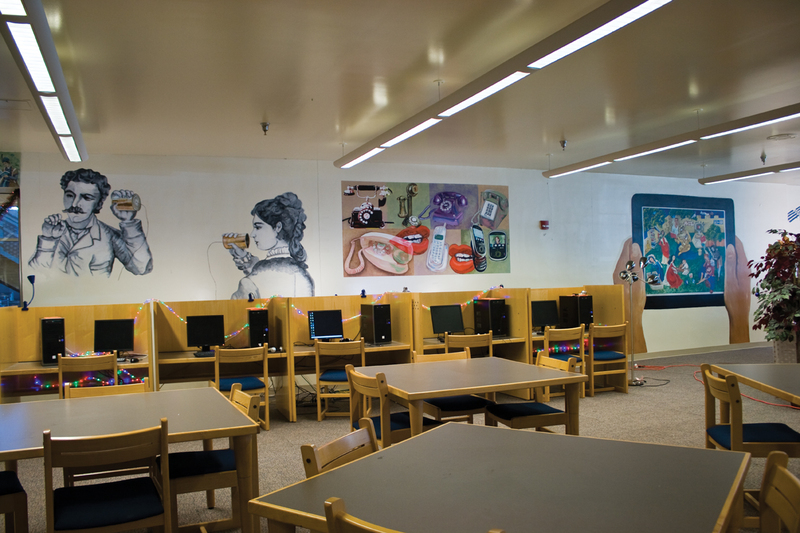 Faith Olen, librarian at Orange County High School’s media center has a vision for exploiting as many tools as possible to help stimulate the student’s experience in their search. One such way is to offer an extraordinary art experience. 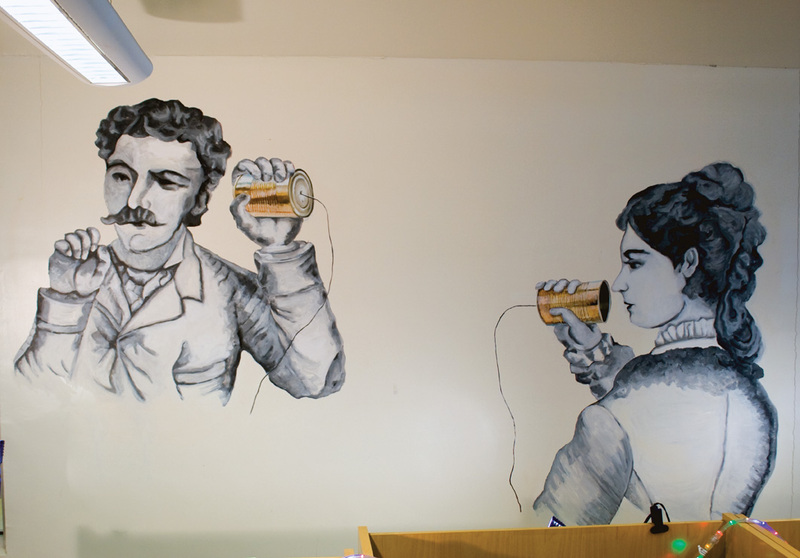 She chose to illustrate “communication” through art with images that illustrate some of the historical innovations and some of the unique tools of communication. 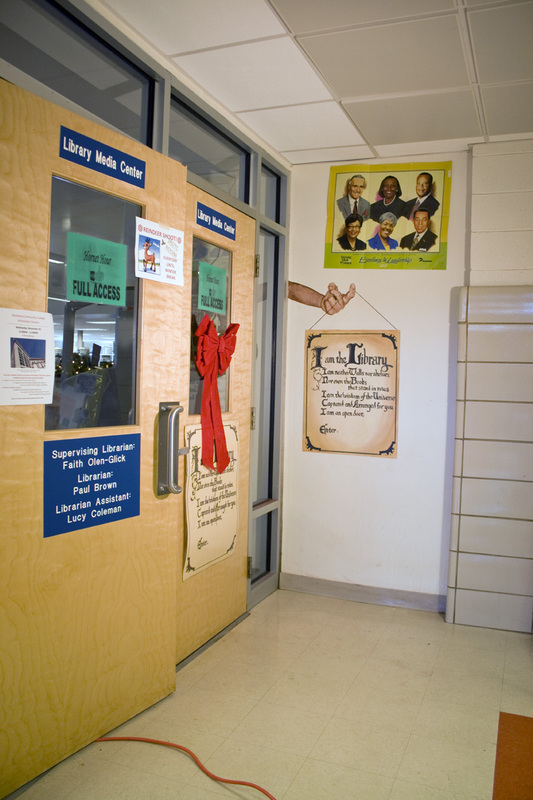 Beckoning Hand – Mrs. Olen wanted something on the outside of the library door enticing one to enter and she wanted to include the library’s motto. 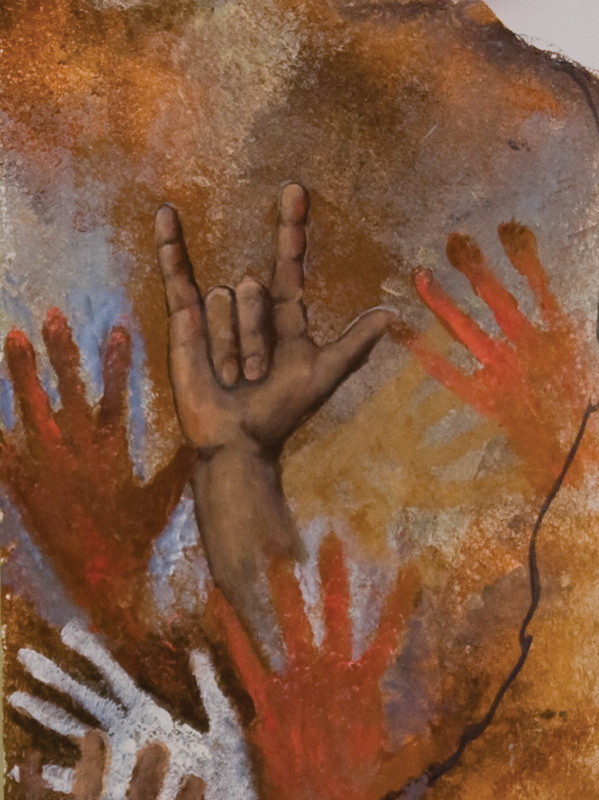 Thus, the hand is communicating with a gesture that says “come here” and the motto is painted to look like old parchment to give it credence. 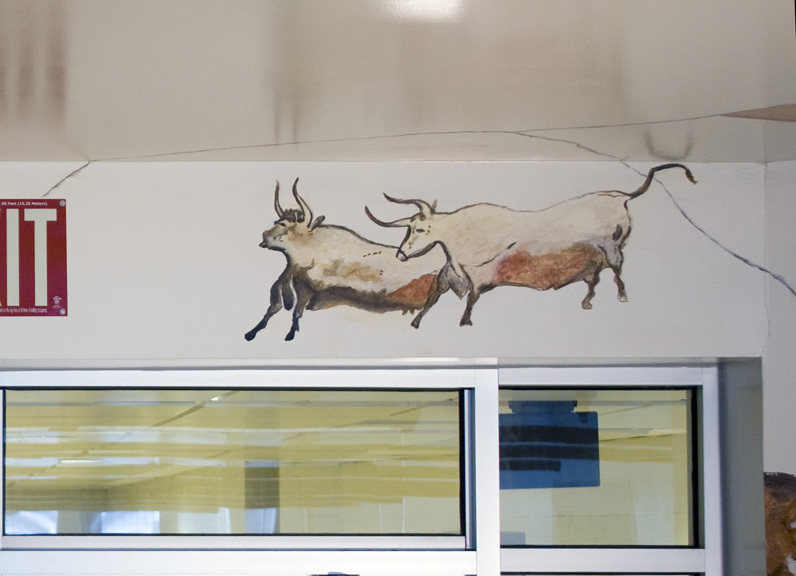 Early communication history – Upon entering the library, I thought we should show the development of communication, as much as possible, using the history of art, and starting with the earliest visual form of cave art. 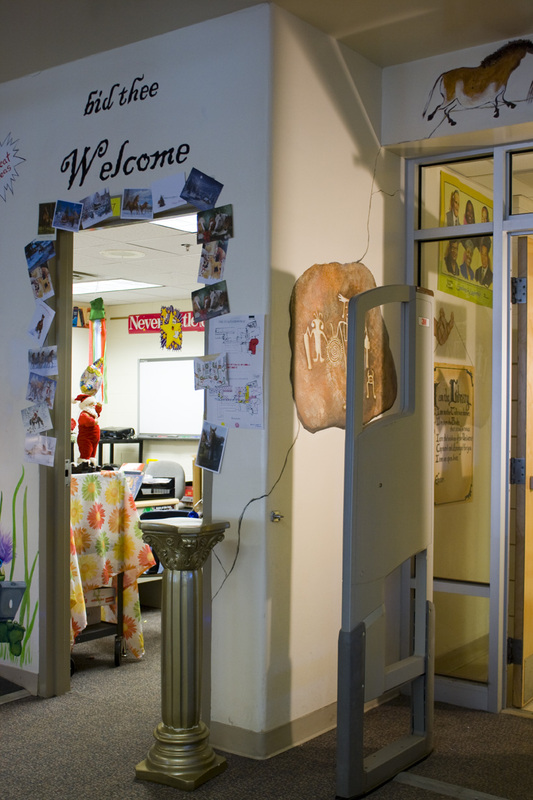 Mrs. Olen wanted some faux cracks in the ceiling and wall, perhaps to express a certain breakthrough for humanity. 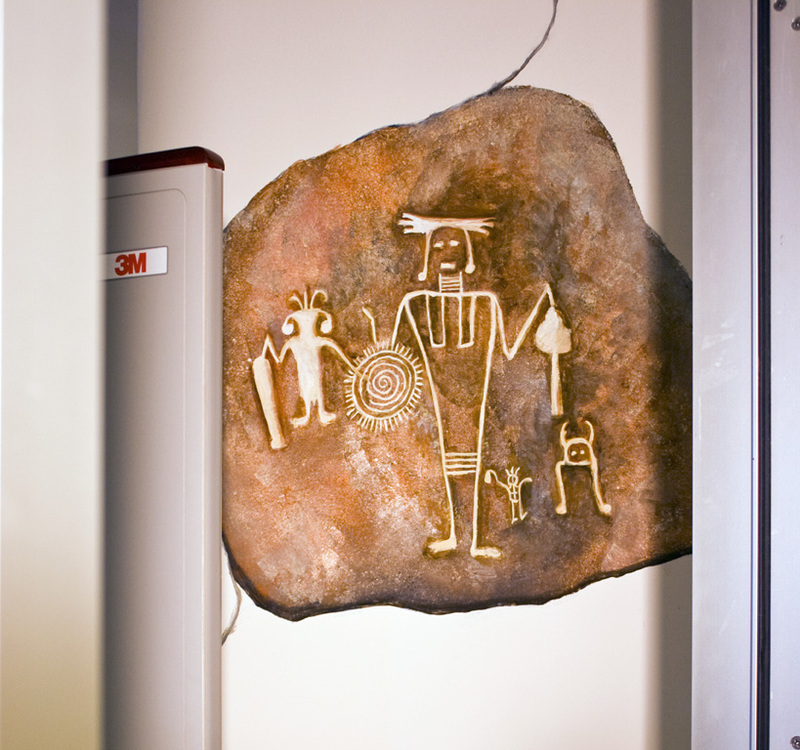 I chose a Native American petraglyph located to the right when you first walk through the door. 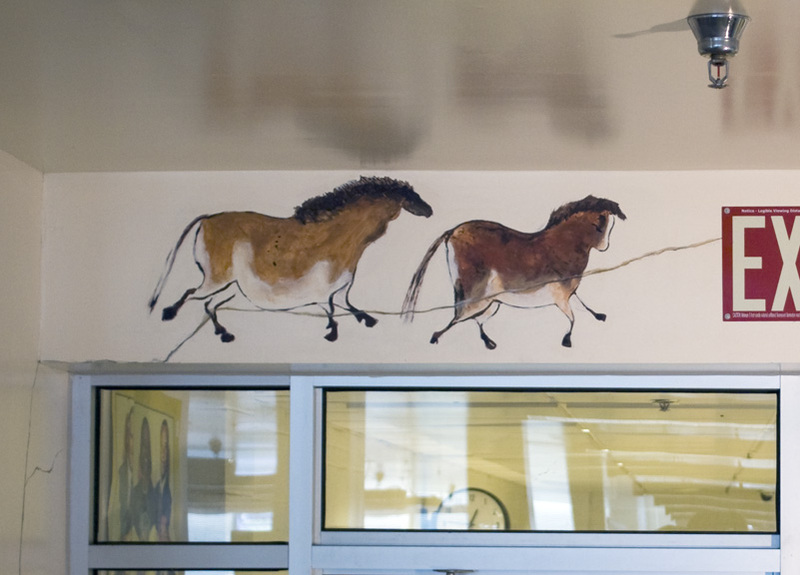 Chosen for two reasons, one, because you normally see depictions of European cave art to represent our ancestors and I wanted to show that our Native American ancestors, on this continent, were busy painting on walls too. Secondly, I chose American petraglyhs, because the images are so amazing and strange. Some of the images, online, truly look like they could have been astronauts from outer space. I hoped one would ponder this possibility. 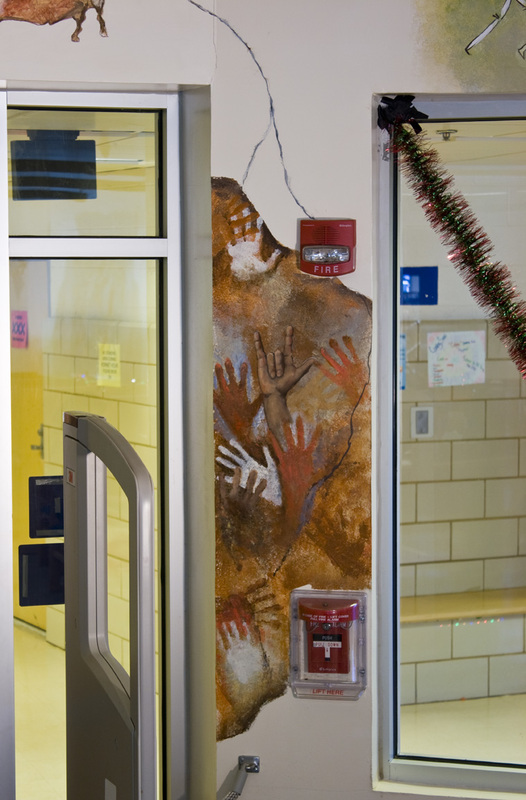 On the left side of the entry way are samplings of hand-prints. 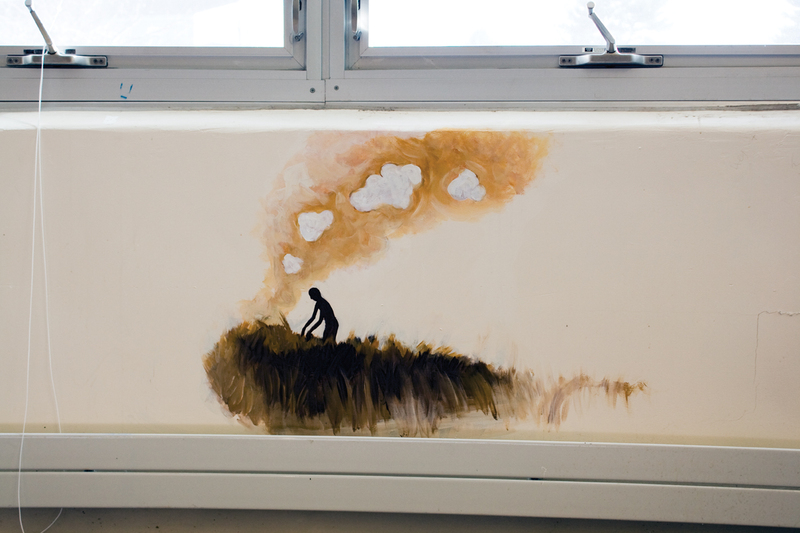 In my research I found many examples where cave dwellers used their hands as the painting utensil. I don’t know what the real intention was behind leaving a print of your hand. Maybe just to say, “I was here”. Among the hand-prints is a hand making the sign for “I love you”, just to show a modern use of hands to communicate. I wanted to keep the coloring subtle, so it would pop out during one of those moments of discovery. Ceiling Frieze – The ceiling frieze starts above the entry doors. 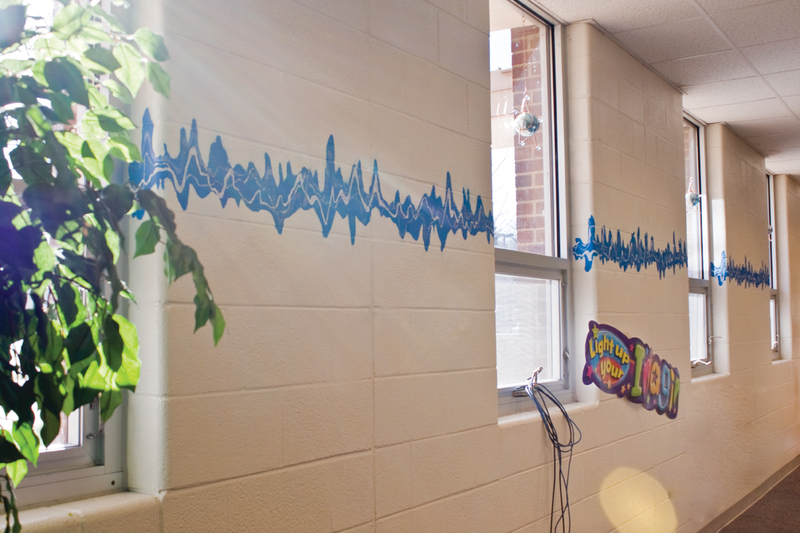 I thought this line of bare wall would be a good place to show a historic timeline, especially since so many early civilizations told stories using the format of a frieze. It continues over several windows. There is also a hand with a paint brush located on the ceiling as another one of those discovery moments. The horses and steer images are from the Lascuax Caves. I added the stick figures, because so much is communicated in just a simple line drawing. The Sumerian stone carving is included because the Sumerians are attributed with having invented the first written language around 3500 b.c. I added recognizably Greek imagery as they are attributed with starting the first library around 500 b.c. . Okay, I admit, these guys got a little pudgy! The Egyptians gave us the first portable and light weight writing surface, known as papyrus. I included a Viking scene with winged horses, because every culture communicates through storytelling. The Chinese are shown in the process of making paper. Not only did they invent paper, but also the first wooden printing press. Lastly, an ancient Indian illustration of a man reading a manuscript was added to represent the passing down of myth, religion and cultural traditions. 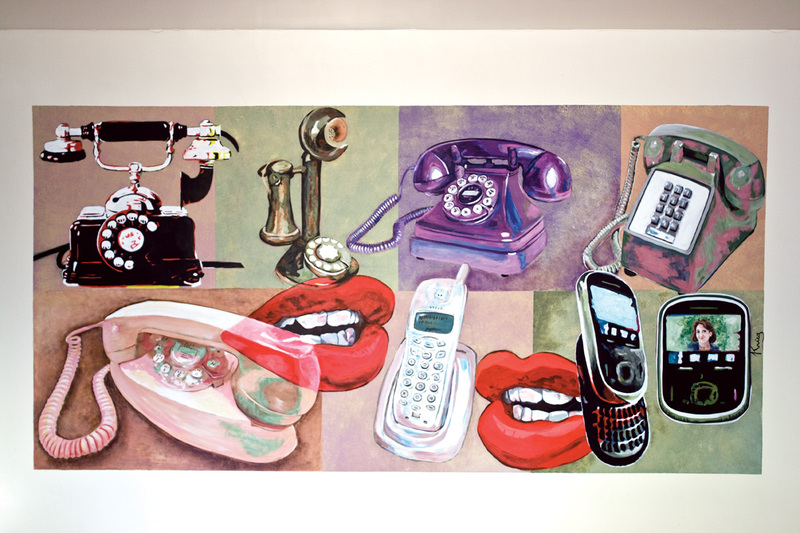 Telephone Wall – I think that the largest American contribution to communication is the telephone, invented by Alexander Graham Bell. Thinking about how he must have come up with this invention, I imagined him using a can and a string to talk to his wife. In this whimsical representation, the string between the tin cans is severed and dangling to suggest how often our communications are lost or mis-communicated. The black and white illustration is representative of the printing press and of Alexander’s time. 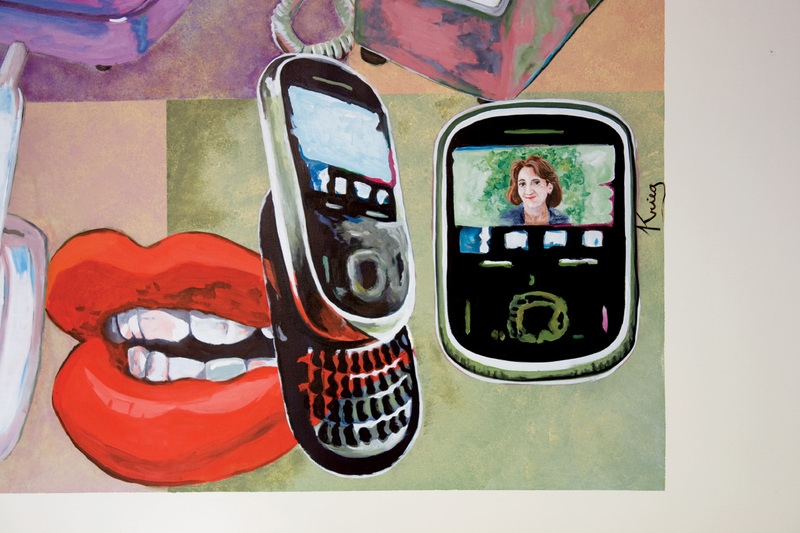 One of my first thoughts for this project was to create an Andy Warhol-like pop art telephone painting, but instead of one repeating just one phone image, I tried to show the progression of the telephone’s visual style. This also provided a unique place for me to add a small self portrait as part of my signature. 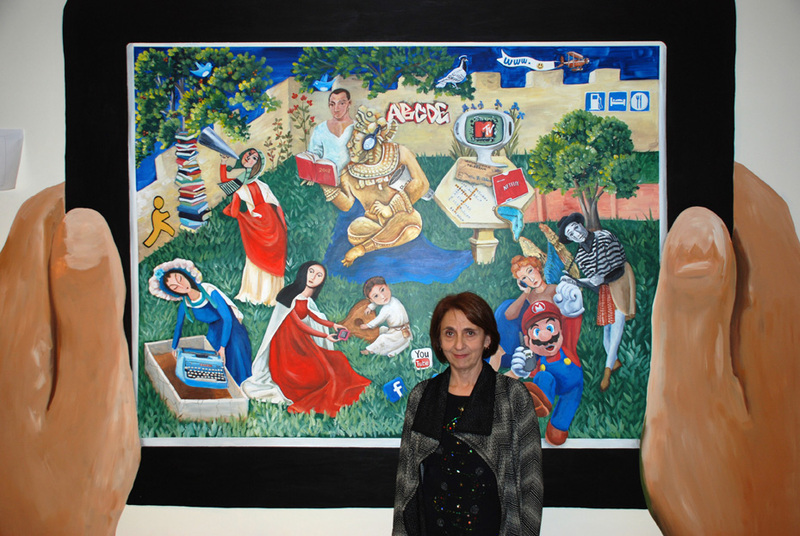 Communication Montage – The student’s research provided so many great works of art from the past and so many symbols of communication that I realized I couldn’t incorporate the entire history of art into this project, so I chose to create one large painting that could contain a multitude of communication symbols and symbolic references from the history of art. I wanted it to be provocative so that the viewer would look for more connections. I wanted it to be a world within a world within a world. The large hands holding an Ipad brings us one level in. 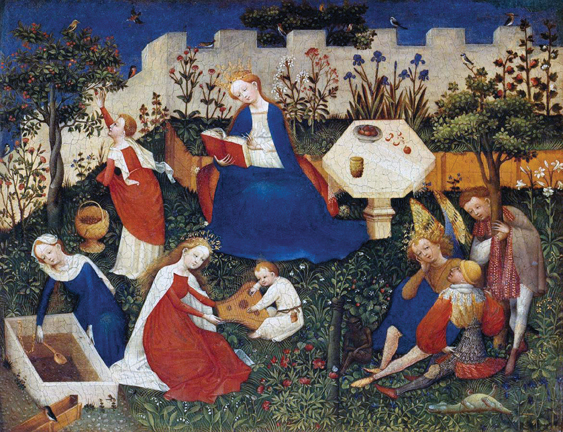 The foundation image on the Ipad is a 15th century German painting by an anonymous artist. I have drastically altered this image by adding various symbols of communication. I chose this image because it represents the dark ages of European civilization and, by adding modern symbols of communication, it suggests enlightenment. Also, it is titled “The Garden of Eden’ which I hope will provoke the reader into questioning, whether or not, all our modern tools and our knowledge are for good or evil. You may note that even though there are all these communication devises in the painting, none of the people are really communicating with each other. They all appear to be in their own separate worlds. 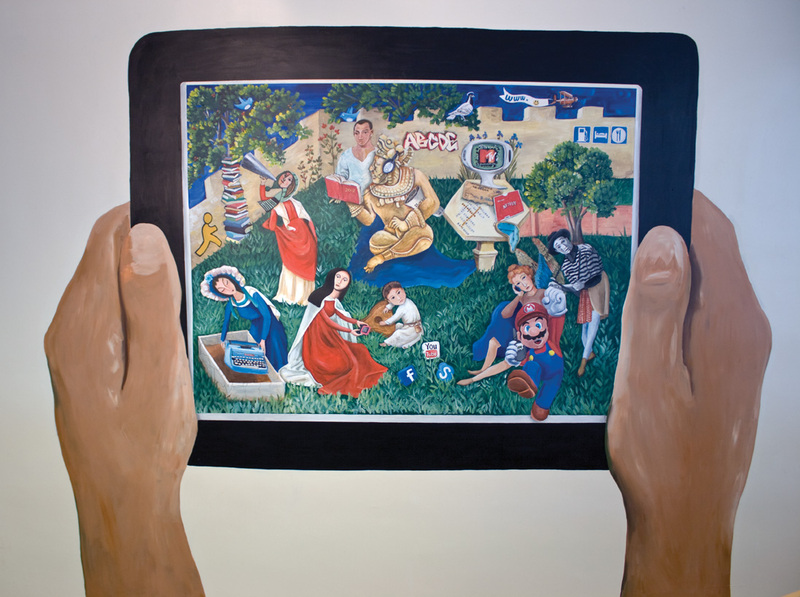 In my version, the central woman reading the book has been replaced by a Mayan figure reading a book titled ‘2012’, a reference to our civilization’s immediate place in time. Picasso’s ‘Self Portrait’ is looking over the Mayan’s shoulder. I chose Picasso to represent our tendency to be self-absorbed. In the real painting by Picasso, he is holding an artist’s paint palette. The birds in the background have been turned into “twitter” birds and a carrier pigeon. The carrier pigeon has a halo, as they are now an extinct breed of bird. There’s a little graffiti alphabet to represent my least favorite form of communication, but communication none the less. Instead of food and drink, the table holds an old fashion television playing MTV. There’s a scrabble game forming words from social media and advertising, a telegram, a netflix movie and Salvador Dali’s surreal dripping watch from his painting titled ‘Persistence of Memory’. Behind the table the banner plane reads www. (smiley face), the emoticon for “have a nice day”. There are also road signs to communicate to the driver places to find food, gas and shelter. The trunk of the tree of knowledge is, of course, made of books; the priestly figure is using a megaphone to get his point across, loudly, and has the head of an abstract Picasso portrait. The woman who, in the original painting, is fetching water has been turned into an opera figure, by Asian artist, Lin Fengmian. As new means of communication are created, the old must be put rest, such as the ancient IBM Selectric type writer. The figure next to this has the head from one of Frenand Leger’s women from his painting titled “The Grand Luncheon’. She is no longer dutifully minding the baby; she is, of course, texting. The baby playing an instrument has a child’s head from a Diego Rivera painting. Social networking symbols are lying about in the grass like toy blocks. The winged angel talking on a cell phone has a Modigliani head. 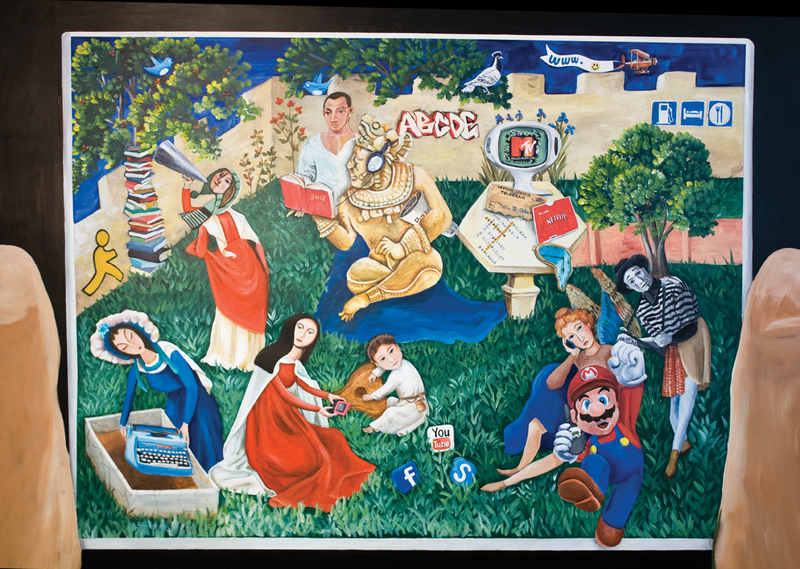 There’s a mime vying for attention and Mario to represent the world of video gaming. It is my intention that the viewer read as much or as little into the painting as he chooses. What’s interesting is to think about how quickly much of this imagery will become archaic. 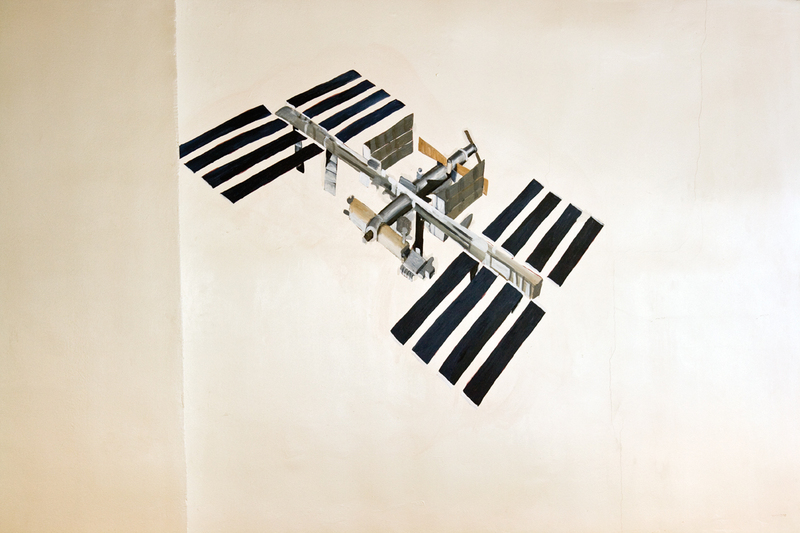 Radio Tower and Communication Satellite – Part of the original Ipad montage had a radio tower on one side and a communication satellite in space on the other side. 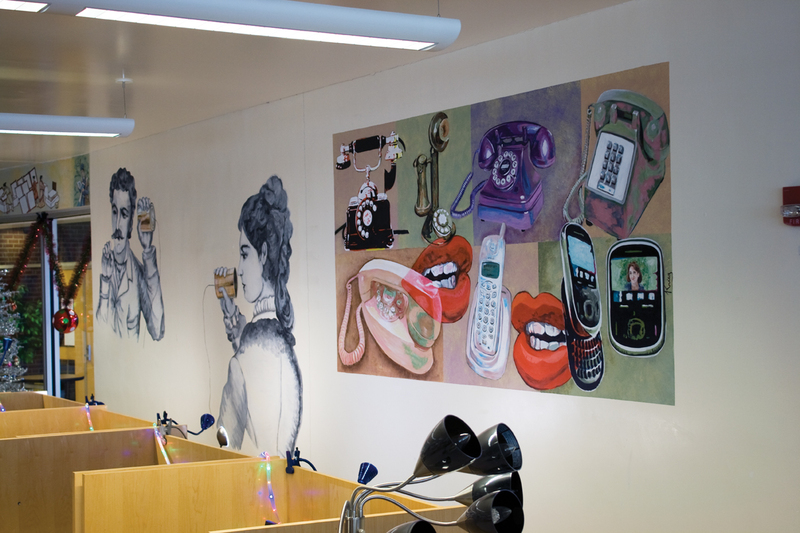 The intention was to depict how vast the space is in which we operate all these devices. 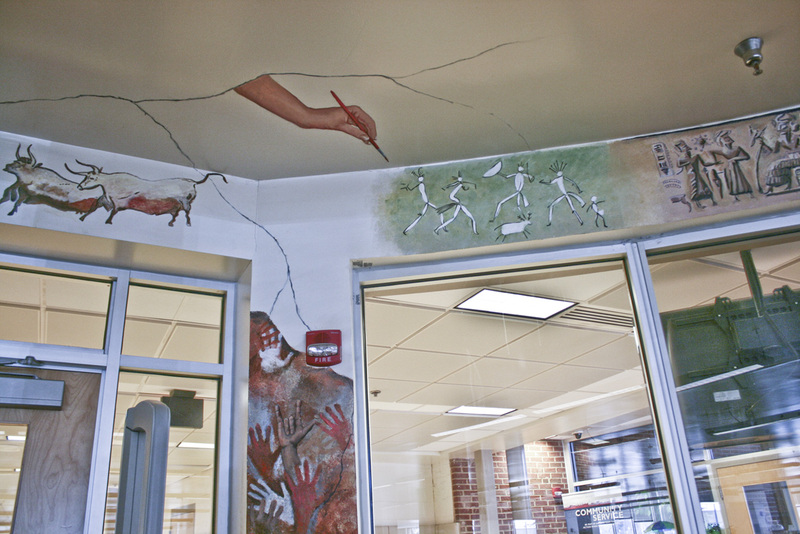 Unfortunately, I had to dodge some of the cracks in the library wall that require patching at later date. 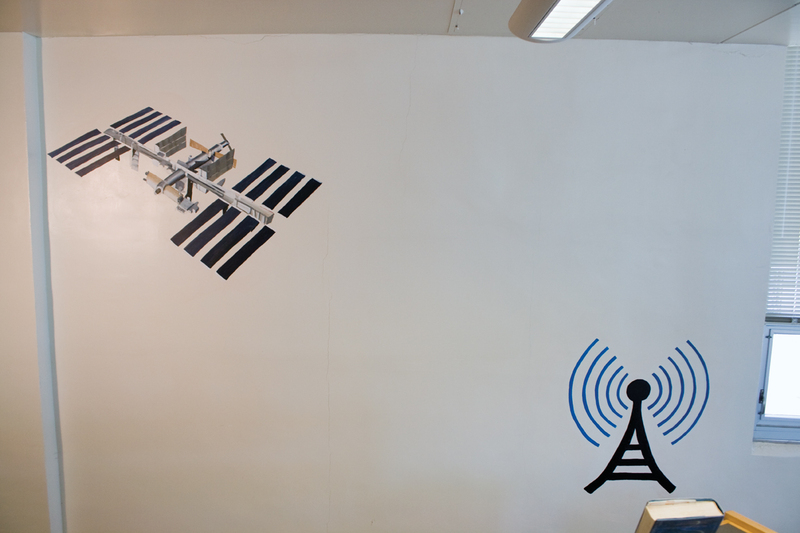 Not wanting to put images in harms way, the tower and the satellite are on an adjoining wall. 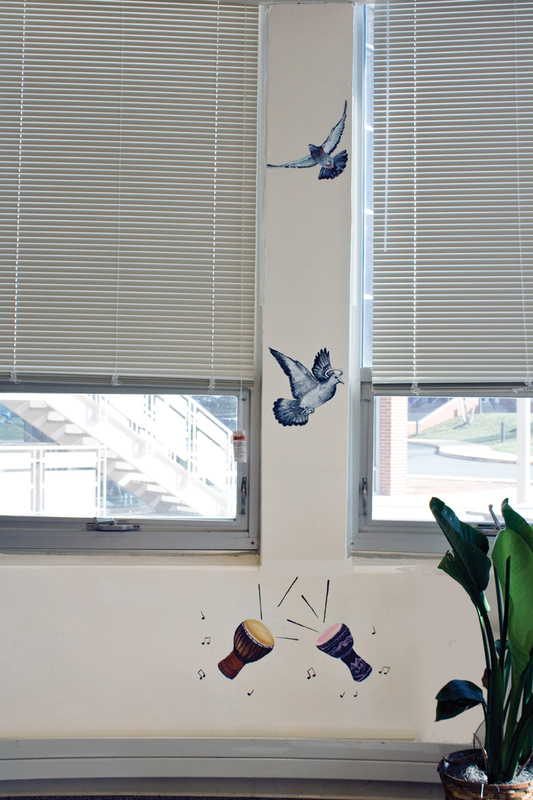 Innovative means of communication on the Bay Window wall – This wall is also broken up by cracks that will someday be patched and so the images are arranged in a hodge podge fashion of unusual methods of communication. The carrier pigeons have been mentioned before, but here they are flying in through the window. African drums not only represent long distance communication, but also the communication of our senses through music. Like drumming, smoke signals reach across distances. 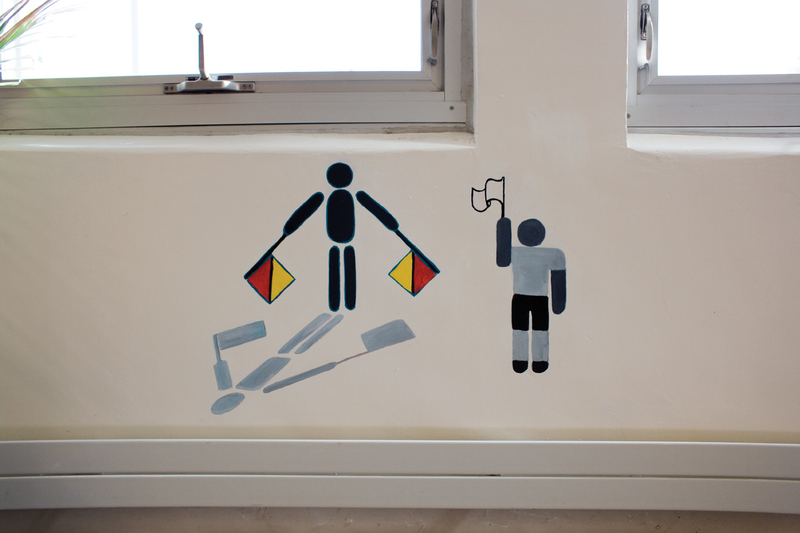 Flags and semaphore are used in many situations to signal or spell out words. 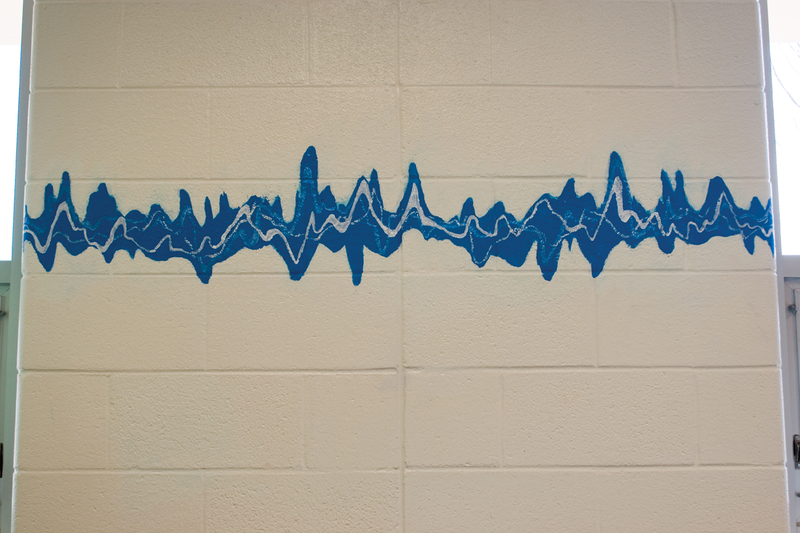 There are so many things I did not have time or room to represent, like morse code would fit here nicely. 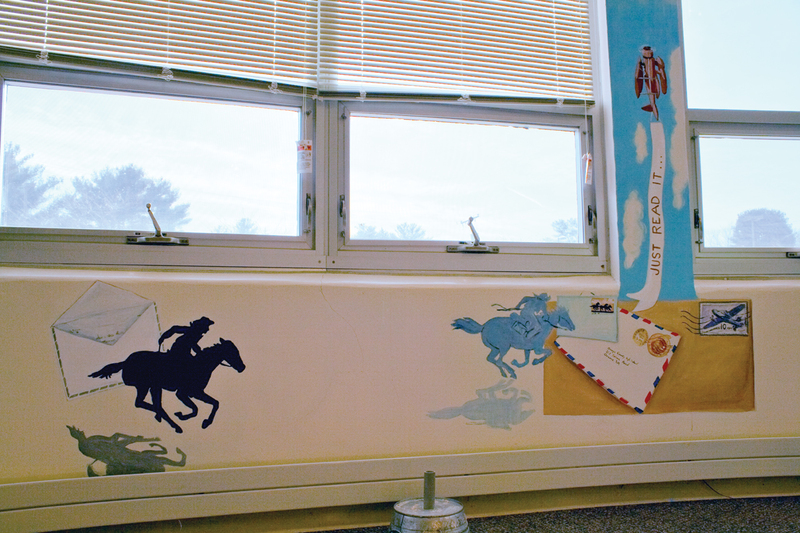 The pony express, the postal system, stamps, air mail and banner planes are represented here. 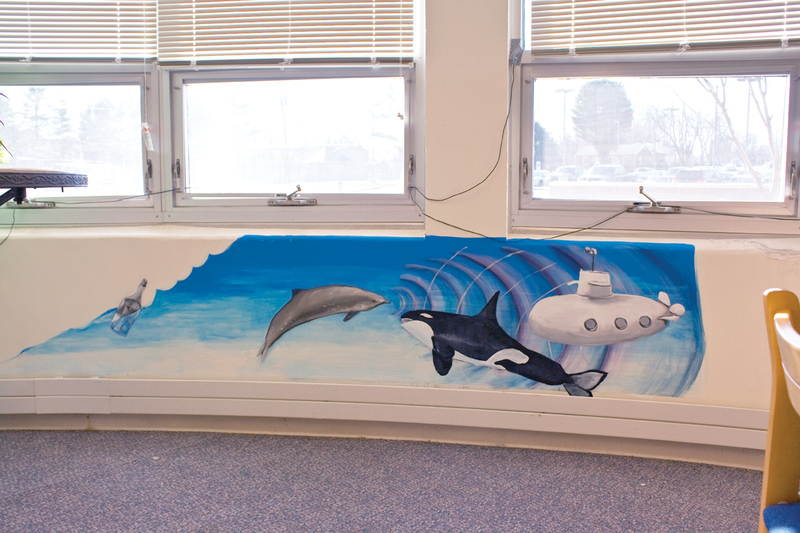 I didn’t want to leave out communication under water or the world of animal communications, so they are represented by sonar used by dolphins, whales and submarines. The message in the bottle is so unique and represents the emotion that backs our communications. 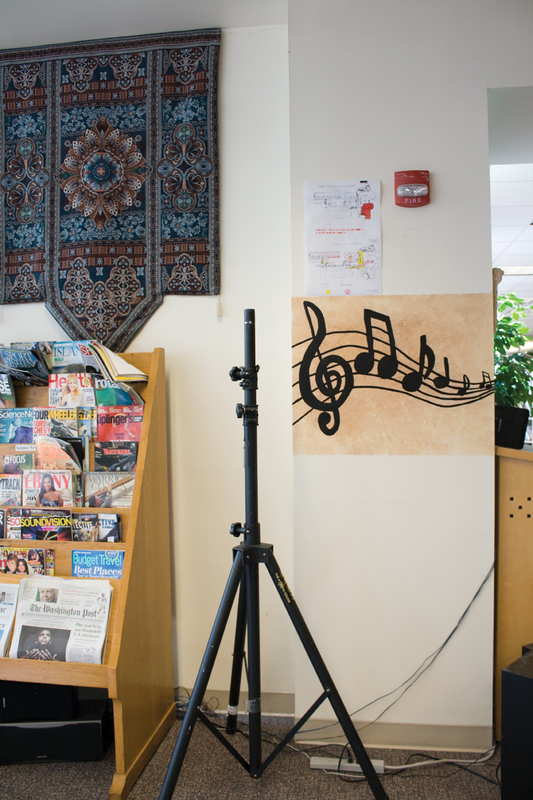 Around the rest of the library are several design elements that offer additional thoughts on communication such as: music notes, theatrical emoticons and visual sound wave patterns. 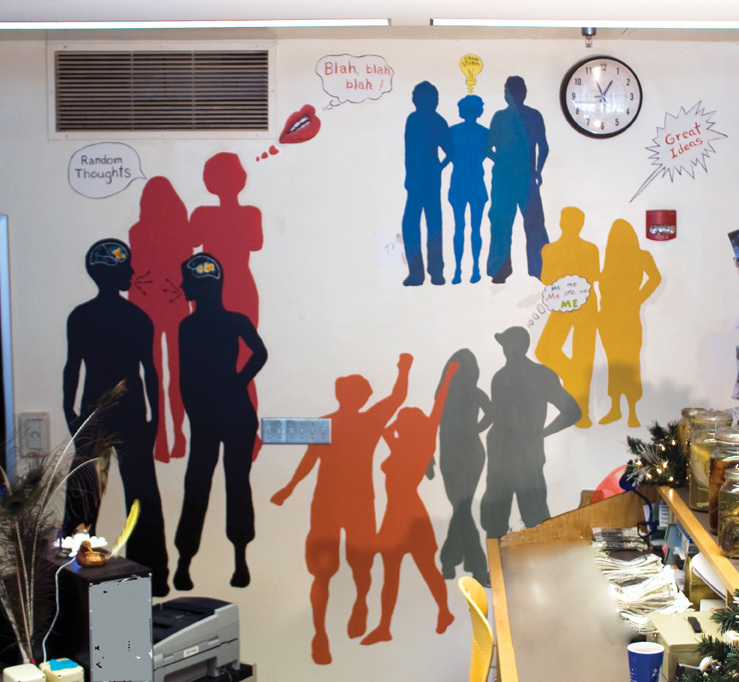 Desk Wall – Arriving at the librarian’s desk I wanted to show that, when it all comes down to it, the most important part of communication is the people, their thoughts and the one-to-one sensory output and input. In our early conversations, we considered depicting two people touching hands, but that just seemed a little too corny like “e.t. phone home”. Then I found out that there were plans to place a television directly in the middle of the wall. 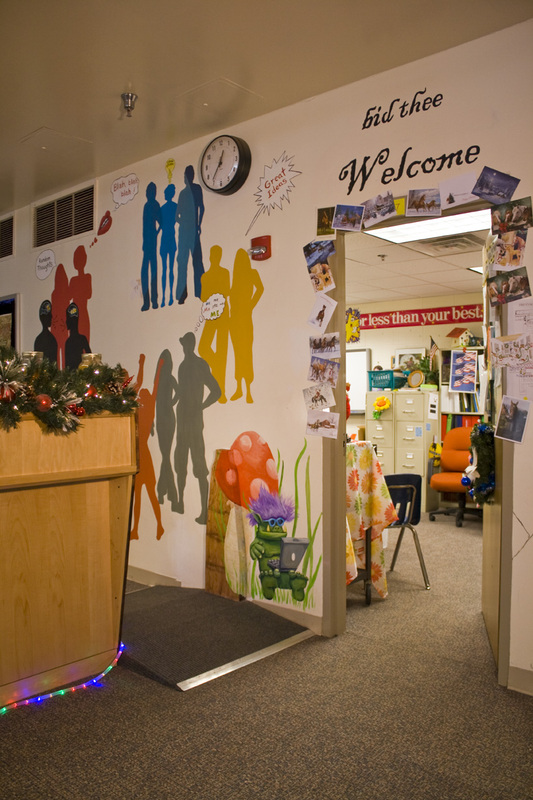 So the final backdrop for the desk wall is groupings of couples that will surround the television, representing all of humanity. After all it’s all about us, reiterated by the thought and speech bubbles. The couple in black shows their brains working. One is what the brain looks like when thinking about words and the other is what the brain looks like when it is hearing words. 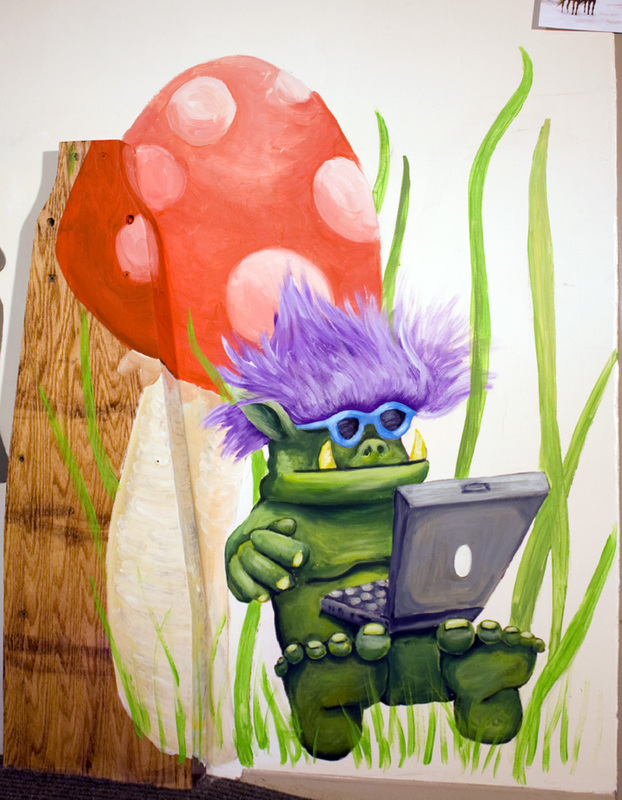 Trixie the Troll – Mrs. Olen thought the space on the wall next to the desk is where a troll would logically live and is now the libraries mascot named, Trixie. 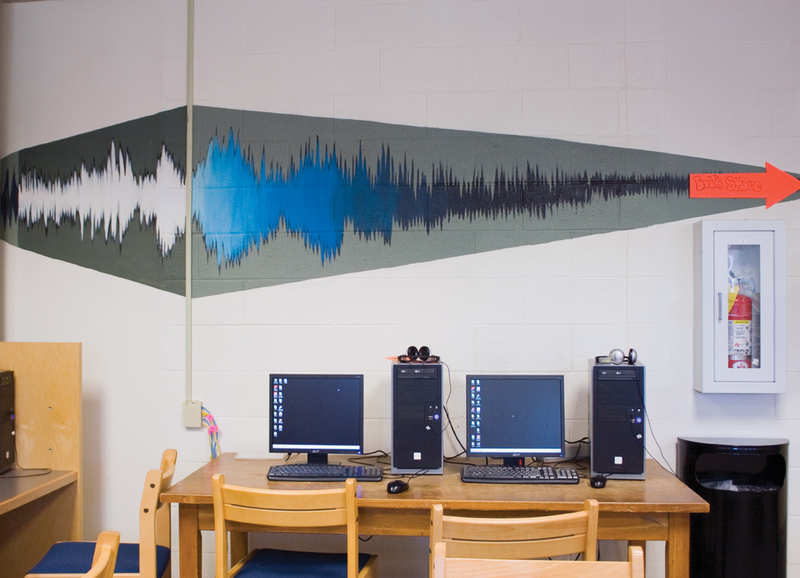 This mural is just phenonomal! What a story it tells! Great work, my dear sister, on a job well done.